Researchers have long-studied magnetotactic bacteria (MTB): aquatic microbes that have the ability to orientate themselves to magnetic fields. This unusual behavior makes them a subject of interest for improving our understanding of biomagnetism, and potentially harnessing their abilities for future technologies, such as medical nanorobots. Neutrons have been used to explore the characteristics of this magnetism, by probing the specialized parts of the cells that are involved. MTBs exert their magnetic navigation skills using magnetosomes – membrane-structures containing magnetic nanoparticles that the bacteria mineralize from their environment. The magnetosomes arrange in a chain that acts like a magnetic compass, allowing the bacteria to move towards the riverbeds they inhabit, using the Earth’s magnetic fields. These unusual nanoparticles have been examined with neutron beams to discover the underlying mechanisms that determine the arrangement and geometry of the chains. An international collaboration of researchers from University of the Basque Countries, University of Cantabria and the Institut Laue Langevin (ILL), have elucidated the precise structural configuration of the magnetosomes in the MTB strain Magnetospirillum gryphiswaldense. They carried out small angle neutron scattering (SANS) on a colloid of MTB, a technique that allows them to see the magnetic microstructure of the organisms in detail in aqueous solution. The D33 instrument was employed because of its polarized neutron beam mode, which allowed the researchers to analyze both the structural components and magnetic arrangement – possible because neutrons will interact with both. Magnetic nanoparticles are central to many applications, ranging from biomedical diagnostics to data storage and even hyperthermia cancer treatments, but the magnetic structures within and in between nanoparticles are challenging to probe directly. Neutron-spin resolved (or ‘polarised’) small-angle neutron scattering is one of the few tools that can be used to investigate nanoparticles in the relevant scale. Using SANS, researchers have gained new insight into the structure of the magnetosome chain. This was previously observed to be bent, rather than straight, yet neutron probing has helped us to explore what is happening further. Neutron probing revealed that the bends do not affect the direction of the net magnetic moment, but do cause the individual nanoparticle magnetic moment to deviate by 20 degrees from the chain axis. 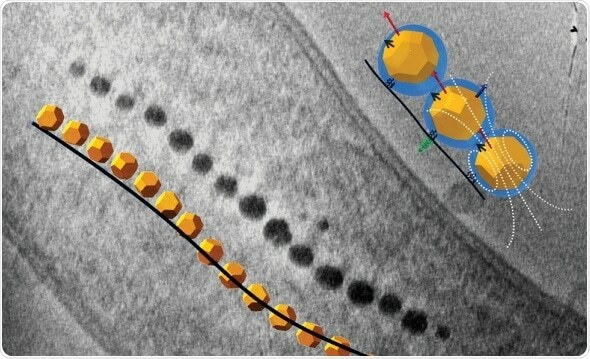 Once the deviation is taken into account, the interplay of the magnetic dipolar interactions between the nanoparticles, and the active assembly mechanism implemented by the bacterial proteins, explains the conformation of the chains in a helical-like shape: it is simply the lowest energy arrangement for the magnetic nanoparticles. These findings, published in Nanoscale, facilitate a better understanding of how the chain behavior might affect applications of MTB. They could guide the development of biological nanorobots, which may deliver drugs or perform minor surgery inside the body. The magnetosome chain of the bacteria could provide directional motion within the steering system. In this case, the precise conformation of the chain would be critical for it to function correctly and navigate around the body. Nanorobots would enable minimally-invasive medical procedures to be carried out, relieving patients of much of the trauma caused by current intrusive surgical methods. Neutron scattering is a valuable tool for examining these magnetosomes and also other materials in great detail. Our small-angle neutron instrument D33 with its polarized beam capability allows us to analyze the magnetic interactions as well as the nanoscale structures, thanks to the magnetic moment of neutrons. With this new information, we are taking a step closer to harnessing the potential of these amazing nanoparticles produced by nature. Amongst the most exciting applications will be those involving medicine – the tiny compass in the bacteria might be used to navigate the human body, and guide nanorobots to carry out tasks in specific organs or limbs."